A buckwheat cookie crust is layered with lemon filling, vanilla pudding, whipped coconut cream and finished with crumbled cookies. Be sure to put the can of coconut milk in the refrigerator so the cream is completely chilled before whipping. This recipe was developed for Cuisine Soleil, a Canadian-based gluten-free and certified organic flour company that produces over 12 flours and a variety of mixes. This uses their buckwheat flakes in the crust: think of this as a glorified oatmeal cream pie. 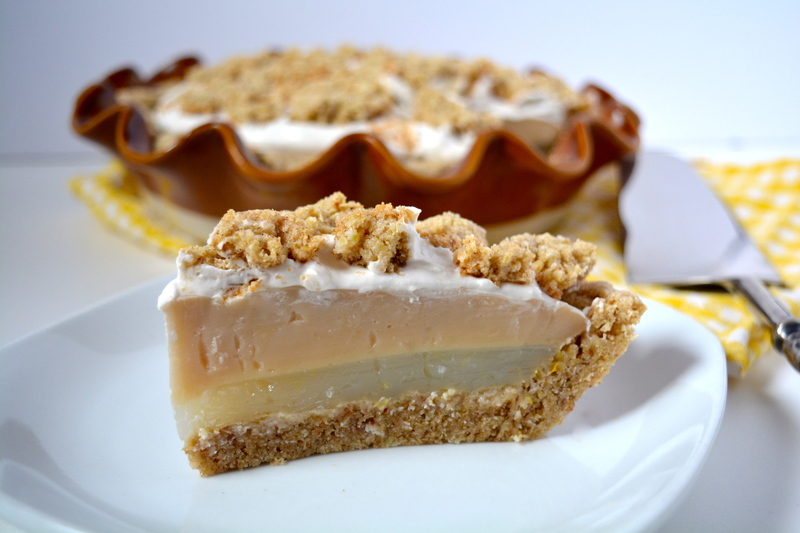 To make the pie crust, grease a 9-inch deep dish pie plate with vegan buttery spread. Line a baking sheet with parchment paper. Preheat the oven to 350 degrees F.
Put the buckwheat flakes, sorghum flour, tapioca starch, xanthan gum, baking powder, baking soda, and salt in a large bowl. Whisk well to combine. Put the sugar and the vegan buttery spread in a large bowl or the bowl of a stand mixer. Using a hand mixer or the stand mixer, beat until creamy and fluffy, about 2 minutes. Add the vanilla extract and the nondairy milk. Beat until well combined, scraping down the sides of the bowl if necessary. Add the flour mixture. Beat on medium speed until well mixed and the mixture begins to clump together. Scoop out about 3/4 cup of the mixture and set aside. Press the remaining mixture into the bottom and up the sides of the prepared pie plate. Spread the reserved 3/4 cup of the mixture onto the parchment paper. Bake for 16 to 20 minutes, until the crust is golden on the edges and firm (but soft) to the touch. It will puff up as it bakes; gently press down the bottom (just enough to remove the puffiness). The cookie on the parchment paper will be golden at the edges and slightly firm to the touch. Cool completely, then break into pieces for the cookie topping. To make the lemon filling, put the water, sugar, zest, salt, and 1/4 cup of the lemon juice into a medium saucepan. Whisk the cornstarch into the remaining lemon juice until dissolved. Bring the water mixture to a boil, then reduce to medium-high heat and pour in the cornstarch mixture, whisking constantly. Cook for 1 minute, until thickened. Remove from heat, stir in the vegan buttery spread. Cool 10 minutes, then pour the mixture into the cooled crust. Refrigerate for 30 minutes before making the vanilla pudding. To make the vanilla pudding, put 1 3/4 cups of the nondairy milk, the sugar, and the salt in a medium saucepan. Whisk the cornstarch into the remaining nondairy milk until dissolved. Bring the sugar mixture to a boil, then reduce to medium-high heat and pour in the cornstarch mixture, whisking constantly. Cook for 1 minute, until thickened. Cool 10 minutes, then pour the mixture onto the lemon filling. Refrigerate for at least 2 to 3 hours until set. To make the whipped cream, open the can of coconut milk, careful not to tip or shake it. Spoon out the hardened coconut cream into a large bowl or the bowl of a stand mixer. Add the icing sugar and vanilla extract. Using the stand mixer or a hand mixer, beat on high speed until light and fluffy, about 1 minute. Spread the mixture onto the top of the cooled pudding. Sprinkle with the cookie pieces. Refrigerate until serving. Store leftovers in the refrigerator.